I’d like to state my gratitude to Hank. His balanced and dispassionate approach to the data from Marcott et al has been invaluable. Because of the format of this blog, in that I rarely split a post to where the reader can’t see the entire post just by clicking on my home page, it is impossible to determine exactly how many people viewed his first post on Marcott. But, we do know that literally thousands have viewed his post. There’s only been one criticism….. and that was pretty mild. I wanted to take a more robust look at the proxies used in the Marcott et al. paper. In the first peek, I had to guess about a number of issues and wasn’t particularly interested in aligning on Marcott’s reference period of 1961 to 1990. My main purpose was to see if there was any evidence of a hockey stick blade in the proxies – more hunting for signals than trying to align on his methods. A commenter, Alex C, suggested that perhaps the reason I didn’t find the HS blade was because I limited my selection of proxies to only the nine that went beyond 1950. I was pretty certain that if there were a HS in the proxies I would have found it in the nine selected. Nonetheless, I can’t dismiss that there might be something in the broader set of proxies that could contribute to a more aggregate hockey stick signal. Alas, curiosity and a desire to be more robust in approach prompted my second expedition for the HS in Marcott et al., 2013. I again did a quick eyeball of the proxy data to identify all of the proxies that contained data up to at least 1900 as that’s where the sudden uptick occurs in Marcott’s reconstruction. I identified 24 proxies that met that inclusion criterion. This time, I wanted to try to align better with Marcott by adjusting the intercept for all proxy anomalies to the same 1961 to 1990 reference mean mentioned in the supplemental paper. An issue that bothered me was the reference / calibration period of 4,500 – 5,500 BP. 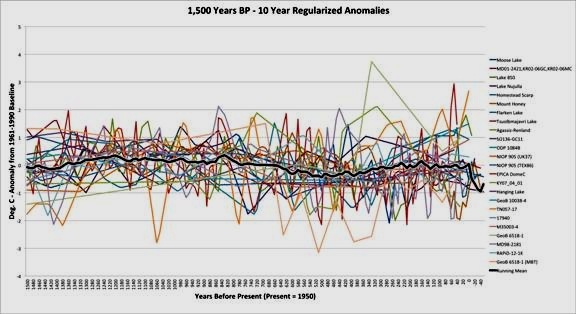 In proxies with very low temporal resolution as used in the reconstruction, I don’t think there is a good representation of variability in this period. I understand why it was chosen – it was the only common range to all 73 proxies. In my latest run of 24 proxies, I took advantage of the fact that there was significantly more range common to all of them. Thus, I selected 1,500 to 6,000 BP as my reference period. My tests between the 4,500 – 5,500 and 1,500 – 6,000 periods demonstrated that the 1,500 – 6,000 BP period balanced the proxy weighting better as I expected. One may argue, “that’s not what they did.” I can’t replicate what they did and will be first to admit it. They’re using “hybrid” models. They wrote their own code and applied methods they haven’t disclosed to the public yet. I wrote my own code that applies good statistical methods to the task at hand. Basically, I’m hockey stick signal fishing. I’m not attempting to replicate their study. It becomes obvious that there is a real problem from 1950 on. The nine remaining proxies, although centered on the 1961 to 1990 mean, are going quite negative. I would caution you to not get too excited about it. At this point, we have a higher ratio of Northern Hemisphere lake sediments and probably looking at a more regional representation of temperatures. Then there’s a statistical problem where dropping from 24 proxies down to only nine dramatically increases error. The above 24-proxy graph is pretty busy. Here is a graph of just the running mean (the black line only). Cut off at 1950. As far as my signal fishing success goes, at 24 proxies, I still haven’t caught a hockey stick. I don’t think there are any in these waters. I’m more convinced that the hockey stick in Marcott et al, 2013 is most likely a calibration of the late proxies to the CRU-EIV temperature series or a direct splice of it. I see a lopsided woman – at least the proxies are starting to get interesting! Minor correction. The first nine proxies extend past 1950. As I recall 17 of the 24 used in this analysis extend up to 1950. Well you go fishing for hockey sticks and get the old MWP as a result, or am I reading wrongly that graph? Hello Lars. Yes, it appears I caught a MWP. That and a LIA on the stringer too. Comparing my running mean graph against the Ljungqvist F.C. 2010 reconstruction, which shows the MWP and LIA quite remarkably, there’s very good alignment. I did a rough eyeball comparison and noted that the temperature extents are also quite close, which provides some reassurance that I got the proxy weighting fairly close. Ah, but you’re not a professional climate scientist. Only professional climate scientists can make the dramatic spiking in temperatures visible from data that carefully hides it. Takes years of schooling to become one. That data is a tricky beast and doesn’t talk easily. There’s a saying among statisticians… If you torture the data enough, it will say anything you want. Torturing the data until it confesses. You can also make it keep quiet on things like the MWP and LIA. Indeed, you need greater length of time and a hockey stick to screw the scaling! Between the lack of clarity in how Marcott et al 2013 obtained their results, and the revelations that will come from Climategate 3.0 FOIA, the AGW/CC crew is having the wind torn from their sails. Given past antics from these pirates of grants I feel you may have to check and ensure all security measures on this site. So how do we begin the process of revoking PhD’s? Then there’s a statistical problem where dropping from 24 proxies down to only nine dramatically increases error. I have found in my travels through the mountains that the peaks and valleys make wonderful proxies. I often see the MWP AND THE LIA. A click of the camera and I have a brand new one. Do you think I could get a grant some where? Maybe one of you filth rich skeptics cut cut me a cheque?? No doubt, as soon as I get mine, I’ll share!!! I’ll be away for a couple of hours – dinner with the Mrs.